"Normal vector" redirects here. For a normalized vector, or vector of length one, see unit vector. This article is about the normal to 3D surfaces. For the normal to 3D curves, see Frenet–Serret formulas. A normal to a surface at a point is the same as a normal to the tangent plane to the same surface at the same point. In geometry, a normal is an object such as a line or vector that is perpendicular to a given object. For example, in two dimensions, the normal line to a curve at a given point is the line perpendicular to the tangent line to the curve at the point. In three dimensions, a surface normal, or simply normal, to a surface at a point P is a vector that is perpendicular to the tangent plane to that surface at P. The word "normal" is also used as an adjective: a line normal to a plane, the normal component of a force, the normal vector, etc. The concept of normality generalizes to orthogonality. The concept has been generalized to differentiable manifolds of arbitrary dimension embedded in a Euclidean space. The normal vector space or normal space of a manifold at a point P is the set of the vectors which are orthogonal to the tangent space at P. In the case of differential curves, the curvature vector is a normal vector of special interest. The normal is often used in computer graphics to determine a surface's orientation toward a light source for flat shading, or the orientation of each of the corners (vertices) to mimic a curved surface with Phong shading. For a convex polygon (such as a triangle), a surface normal can be calculated as the vector cross product of two (non-parallel) edges of the polygon. That is, any vector orthogonal to all in-plane vectors is by definition a surface normal. is the upward unit vector. are the x and y unit vectors. If a surface does not have a tangent plane at a point, it does not have a normal at that point either. For example, a cone does not have a normal at its tip nor does it have a normal along the edge of its base. However, the normal to the cone is defined almost everywhere. In general, it is possible to define a normal almost everywhere for a surface that is Lipschitz continuous. A normal to a surface does not have a unique direction; the vector pointing in the opposite direction of a surface normal is also a surface normal. For a surface which is the topological boundary of a set in three dimensions, one can distinguish between the inward-pointing normal and outer-pointing normal, which can help define the normal in a unique way. For an oriented surface, the surface normal is usually determined by the right-hand rule. 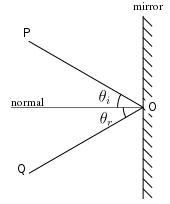 If the normal is constructed as the cross product of tangent vectors (as described in the text above), it is a pseudovector. When applying a transform to a surface it is often useful to derive normals for the resulting surface from the original normals. Write n′ as W n. We must find W.
, or an n′ perpendicular to t′, as required. Therefore, one should use the inverse transpose of the linear transformation when transforming surface normals. The inverse transpose is equal to the original matrix if the matrix is orthonormal, i.e. purely rotational with no scaling or shearing. The normal line at a point of the hypersurface is defined only if the gradient is not null. It is the line passing through the point and having the gradient as direction. The Jacobian matrix of the variety is the k×n matrix whose i-th row is the gradient of fi. By implicit function theorem, the variety is a manifold in the neighborhood of a point of it where the Jacobian matrix has rank k. At such a point P, the normal vector space is the vector space generated by the values at P of the gradient vectors of the fi. In other words, a variety is defined as the intersection of k hypersurfaces, and the normal vector space at a point is the vector space generated by the normal vectors of the hypersurfaces at the point. The normal (affine) space at a point P of the variety is the affine subspace passing through P and generated by the normal vector space at P.
These definitions may be extended verbatim to the points where the variety is not a manifold. This variety is the union of the x-axis and the y-axis. At a point (a, 0, 0), where a ≠ 0, the rows of the Jacobian matrix are (0, 0, 1) and (0, a, 0). Thus the normal affine space is the plane of equation x = a. Similarly, if b ≠ 0, the normal plane at (0, b, 0) is the plane of equation y = b. At the point (0, 0, 0) the rows of the Jacobian matrix are (0, 0, 1) and (0, 0, 0). Thus the normal vector space and the normal affine space have dimension 1 and the normal affine space is the z-axis. Surface normals are essential in defining surface integrals of vector fields. Surface normals are commonly used in 3D computer graphics for lighting calculations; see Lambert's cosine law. Surface normals are often adjusted in 3D computer graphics by normal mapping. Render layers containing surface normal information may be used in Digital compositing to change the apparent lighting of rendered elements. The normal is the line perpendicular to the surface of an optical medium at a given point. In reflection of light, the angle of incidence and the angle of reflection are respectively the angle between the normal and the incident ray (on the plane of incidence) and the angle between the normal and the reflected ray. ^ "The Law of Reflection". The Physics Classroom Tutorial. Retrieved 2008-03-31. Weisstein, Eric W. "Normal Vector". MathWorld. Clear pseudocode for calculating a surface normal from either a triangle or polygon.